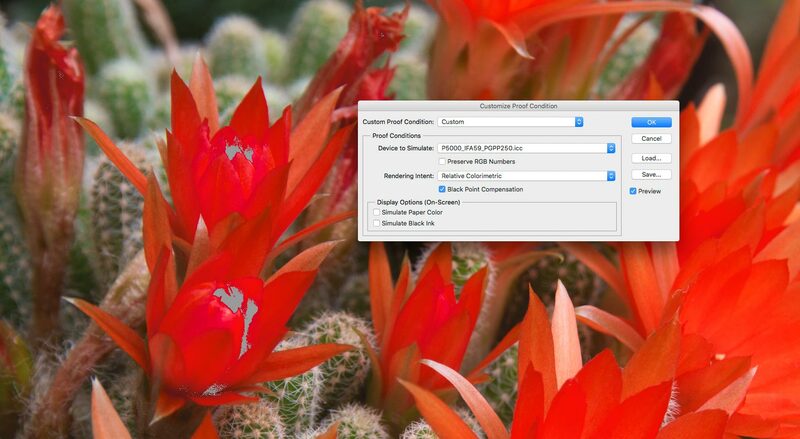 When recently testing the BenQ SW240 wide gamut monitor for a review, Keith used a photograph of some brilliant orange-red cactus flowers to show how monitor gamut affects image editing. Such colours are also tricky to print, so Keith has written up this short article about some of the ways he goes about making such a print. It’s written as suggestions for things to consider, definitely not a step by step guide. 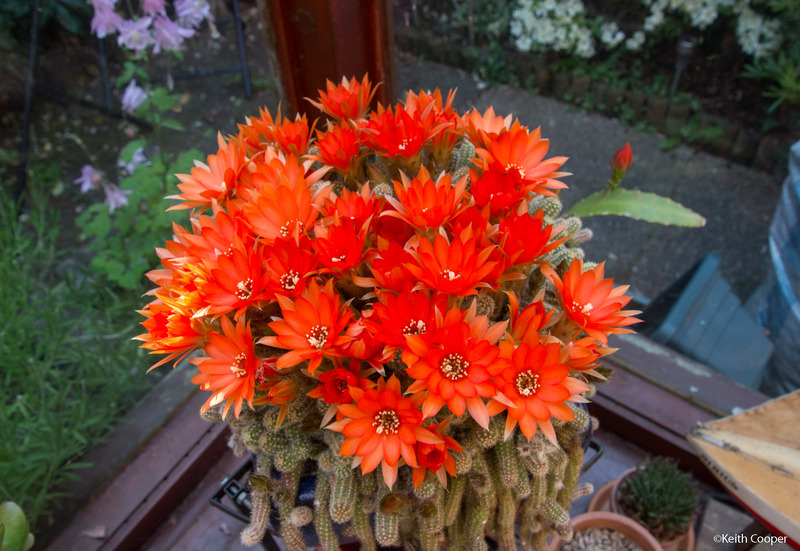 The flowers appeared over a few days in our conservatory, where my assorted cacti seem to have decided that this year is one for bright colour. I’ve no idea what sort of display or browser you are using, so all the images here are reduced to the ‘web standard’ smaller sRGB colour space. As such, it makes it very difficult to show the subtle changes I’m seeing in screen views and prints. I’ll try and show the main points in other ways as well, but remember that the key aim of this article is to help you make better prints, not by giving any particular workflow, but by considering the factors that you might need to consider for your work. Exposure is always tricky for such intense primary colours, with autoexposure systems invariably blowing out (clipping) the intensely bright red channel. The shots were deliberately underexposed to retain detail in all three channels (I almost always use manual exposure – something that you get better at with practice). This is the one I’m printing. I’m using Adobe Camera Raw with Photoshop CS6, so some steps may be different for your edit workflow. Opening up the RAW file and looking at the histogram for the image in sRGB, Adobe98 and ProPhoto (smaller to larger gamut) shows how the strong reds are being clipped in the smaller colour space. I’ve not changed any edit settings, I’m just looking at image clipping – the spikes at the bright and dark ends of the histogram. You may note that the ISO is set to 200, if this was a shot that I specifically wanted for a print I’d have used my 50MP 5Ds, a tripod (with geared head), a better lens, and set at 100 ISO. This is however just a quick photo taken in the conservatory to show the colours (for the monitor review). 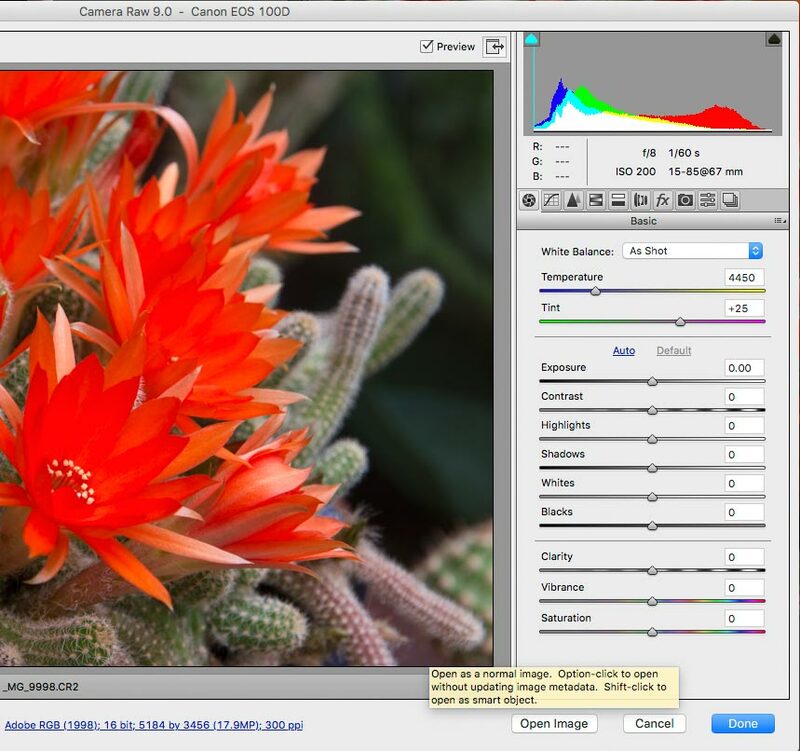 Now, only changing the colour space setting in ACR to Adobe 98. A larger space which holds the bright reds, but has some difficulty with the deep shadows. Moving up to the much larger ProPhoto, we see no clipping at either end. The image in ProPhoto needs to be processed in 16 bit mode if we’re planning to do any adjustments. 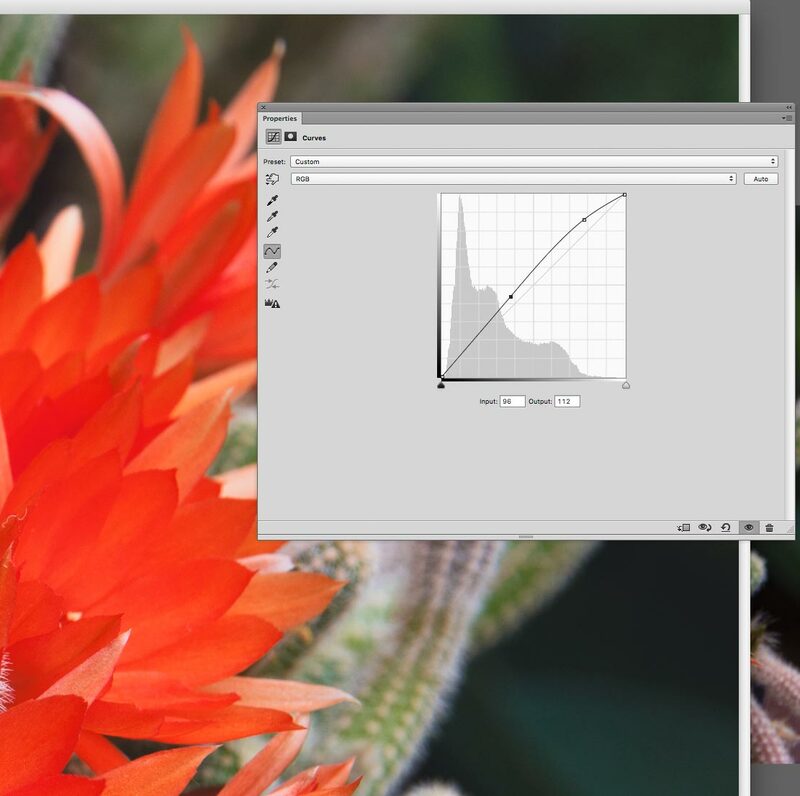 If you’re using Lightroom (I personally dislike it, but YMMV) then its internal working space is of similar gamut to ProPhoto, but you should still check the histogram for clipping. 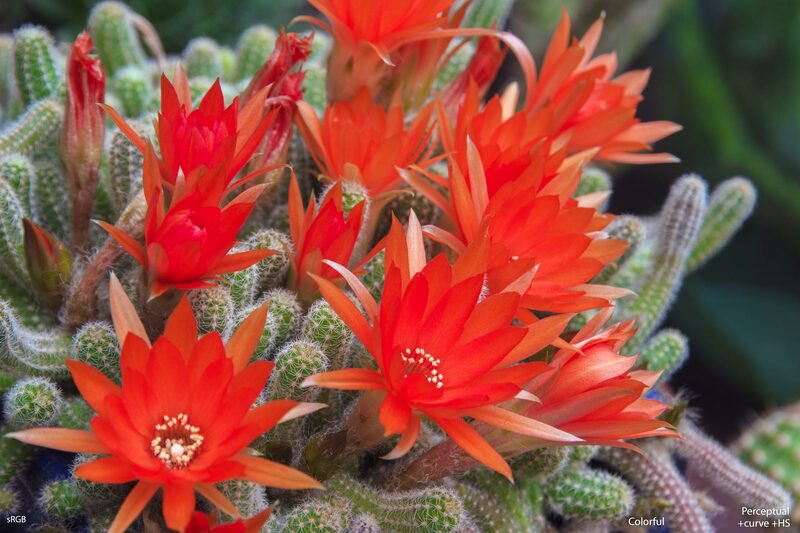 There is distinct detail in the flowers – they are not simple blotches of intense colour. 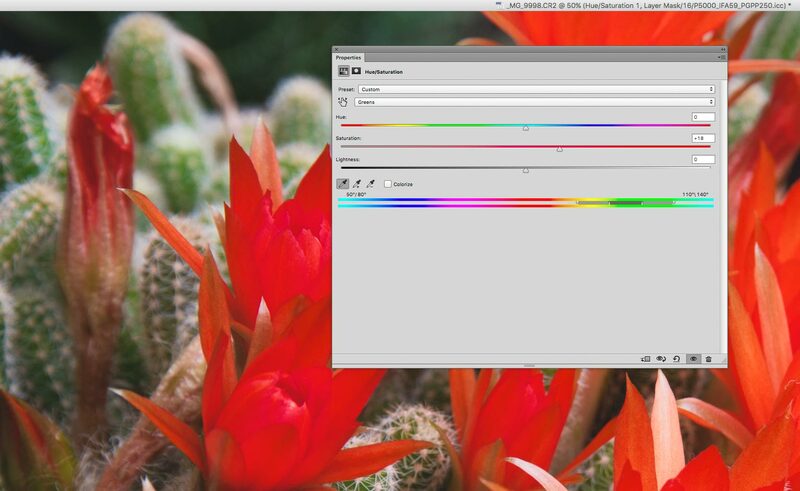 OK, I’ve got a file in a huge colour space – what will I see on my monitor? It was during testing the BenQ SW240 that I started looking at this file. 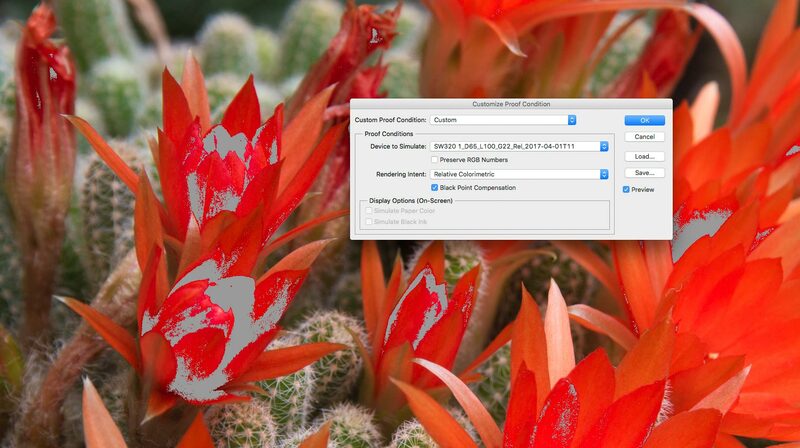 The difference between my oldish MacBook Pro display and the near Adobe98 gamut of the SW240 were clear. On the big display you could see details in the flowers and on the laptop, they merged to become coloured blocks. However I’ve edited images in the past on non-wide gamut monitors, with ‘missing colours’ – what was this new monitor missing? 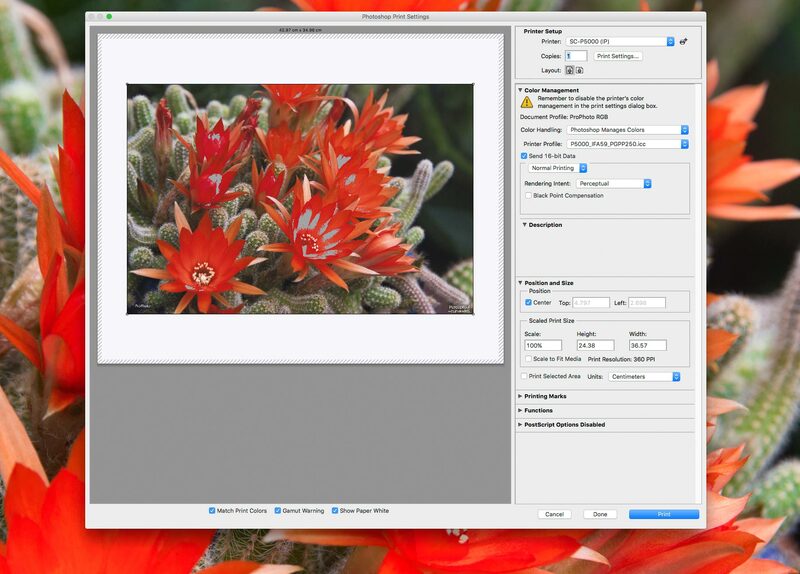 In Photoshop you can select a number of soft proofing options, where Photoshop does its best to display a different gamut/profile image on your display. Obviously it can’t display colours that your monitor can’t manage, but used with care (and understanding its limits) soft proofing can be a useful guide. 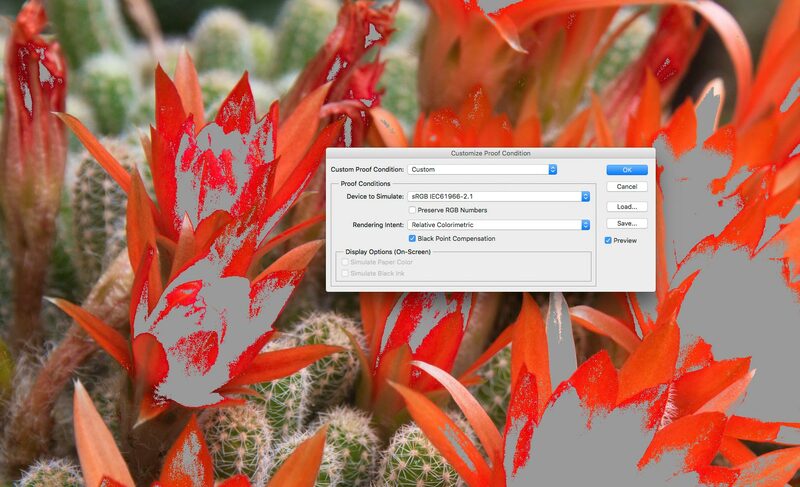 One other feature of this I’ll use is Photoshop’s ‘Gamut Warning’ where it points out areas of an image that exceed the gamut of the device (display or print) that you are soft-proofing. And lastly, the subtly different parts that my BenQSW320 monitor won’t display accurately, just as close as it can (the SW240 has a similar gamut – I was editing these files in my office). 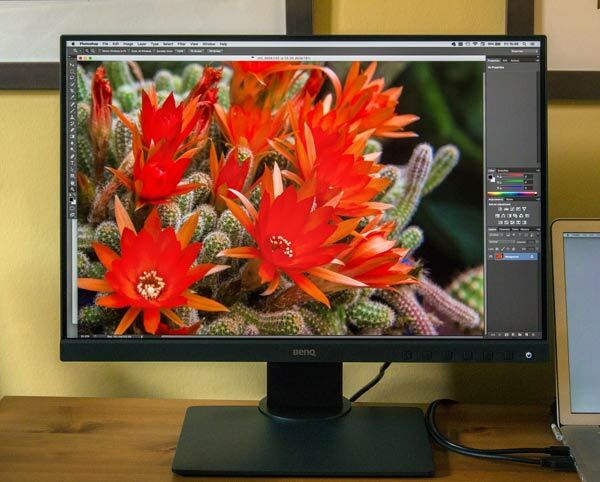 I’ve calibrated this monitor to its ‘Native’ settings (with an X-Rite i1Display pro colorimeter) where obviously it has a bit more gamut for the colours here, than straight Adobe98. Just one caveat though – the gamut warning is a yes/no tool – it draws no distinction between fractionally out of gamut and hopelessly so – all are shown grey here. As I said – something to use with care. The gamut check tells you where to be careful in editing images not how to do it. However, this article is about making a print, so I need to consider what printer/paper/inks I’m using. I’m making a print with the Epson SureColor P5000 (review) which happens to be rather good for such images since it has orange and green inks as well as the normal CMYK variations. If also using a glossy paper that I know from past experience has very good colour rendition. It’s Innova IFA-59. Unfortunately not directly available any more, but a good glossy photo paper would be similar. I need to profile it for the P5000 to make my custom ICC printer profile. To do that I will print a test target of just under 3000 patches. 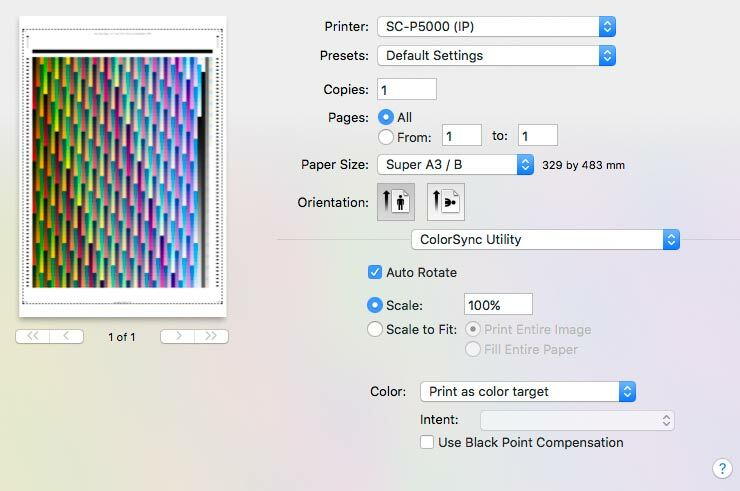 I use my Mac’s Colorsync Utility to print, since it has a ‘color target’ mode. 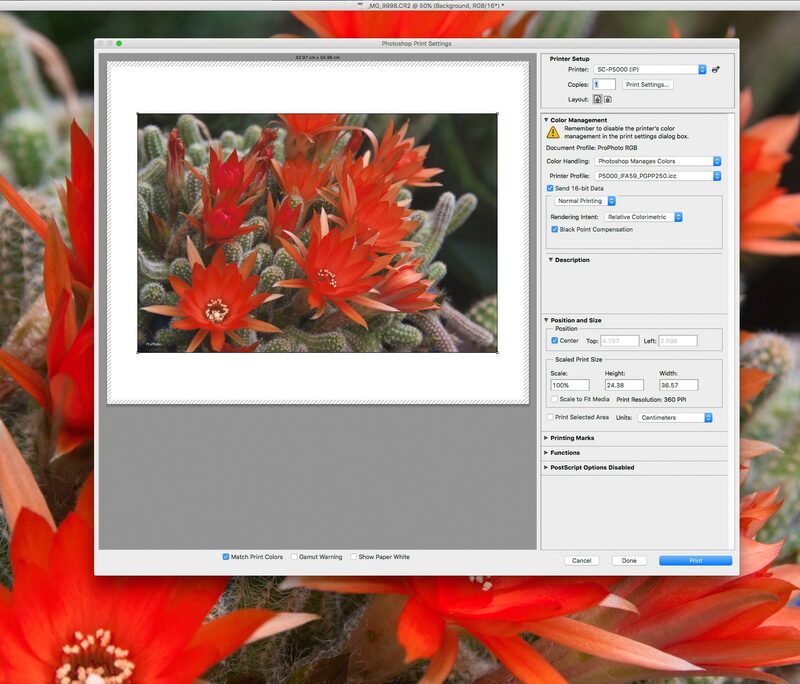 You could also use the free Adobe Print Utility (Mac or Win). 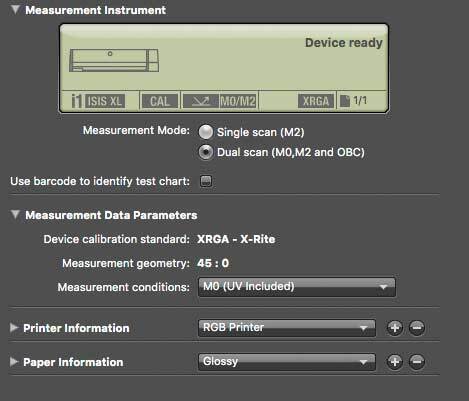 I’m using X-Rite i1Profiler to build a custom ICC profile for this paper/printer. I’m using the ‘premium glossy photo paper 250’ media setting. The profiles you get from manufacturers and paper suppliers are often very good these days. However, I still like to make my own. My 3k patch targets are significantly larger than often used. I’ve created a lot over the years and find that even looking at the target tells me a lot about how the printer/paper will manage strong colours. After drying overnight, I scan the target with my X-Rite iSis XL spectrophotometer. I’m scanning with ‘UV Included’ since I know the paper has a moderate amount of optical brightener (OBA). There are options for refining profiling to allow for OBA under different lighting, but that’s a bit beyond what I need here. 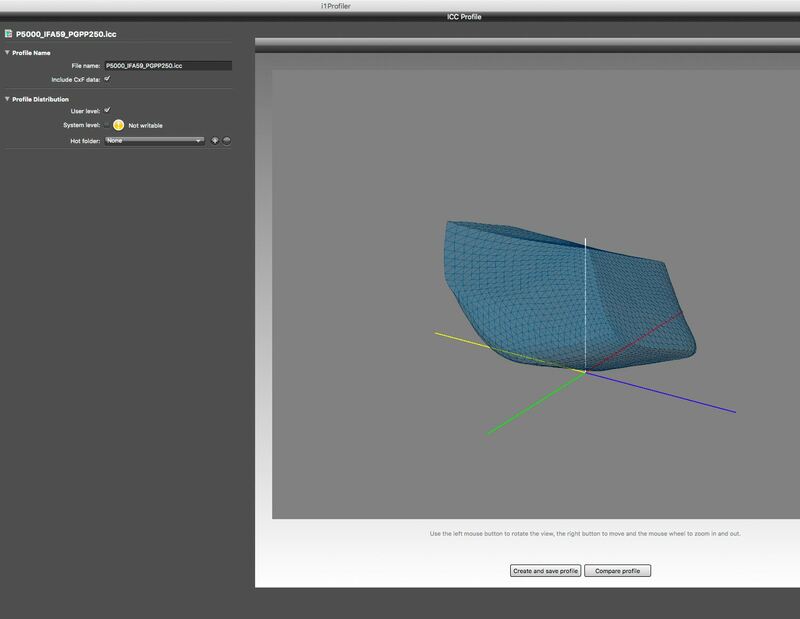 The software gives me a representation of the profile’s gamut – importantly, I notice that the shape is smooth without bumps or holes (often signs of something amiss). I can now repeat the soft proof gamut tests from earlier, but with the paper profile. That’s nice – hardly anything showing up grey. This is on a printer with an orange ink – it’s even more obvious as you move to the P800 or P400 on matte papers, although less so again for bright shiny papers. 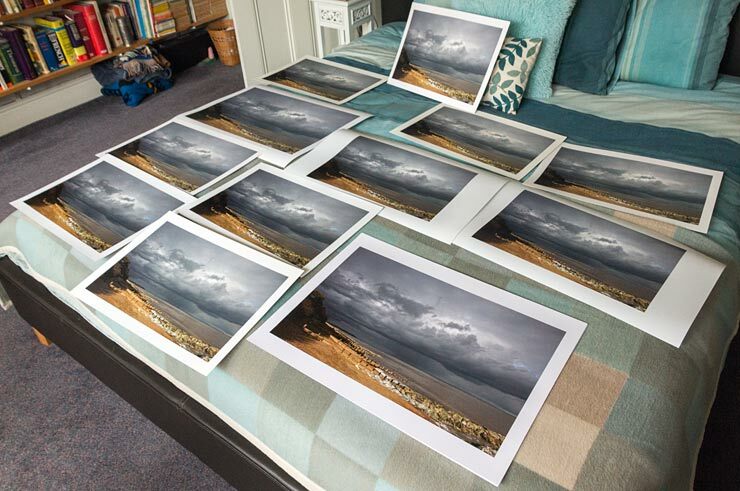 So, I now have a profile for the paper – time for some prints. I’m printing directly from Photoshop, and since I’m concentrating on colour and tone here, I’m not applying any particular sharpening or other processing. 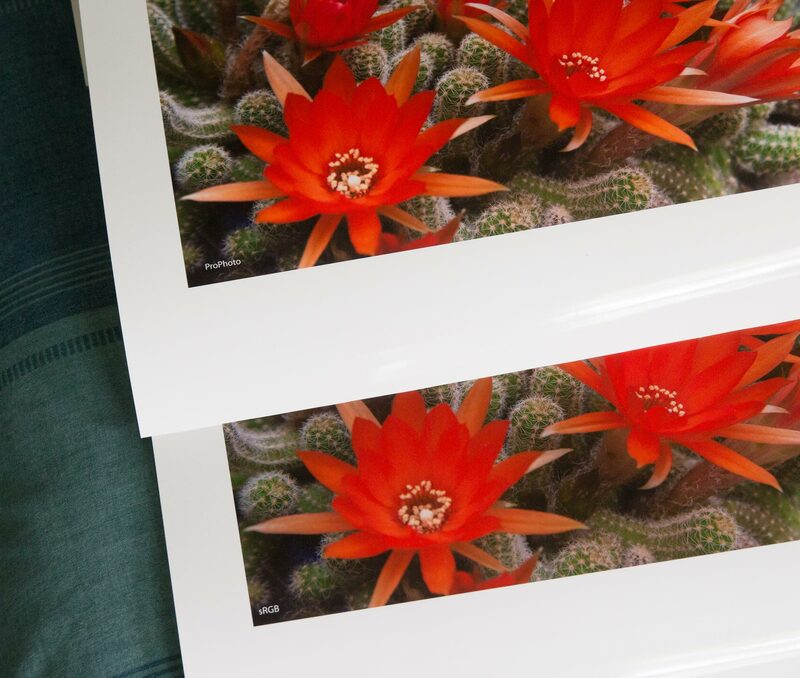 The prints are on a 17″ width roll of paper, so a simple setting of the print to 360 PPI reduces the size a bit and fits with a good border on a custom 35cm page size (so, 45cm x 35cm). If you were trying this you could use whatever paper you had for experimenting – remember it’s colour reproduction I’m testing. I’ve selected the ICC profile I just made and I’m printing the version of the RAW file processed into the largest ProPhoto colour space. My rendering intent is set at relative colorimetric and black point correction (BPC) is set. This is pretty much my standard print setup. Paper size and media are set in the printer driver. You may have noticed some text on some of the images shown – this is purely to tell the prints apart later and remind me of the settings. There were two versions of the photo printed – one sRGB and one ProPhoto. Each was processed in ACR at the settings that gave a good looking basic image – this meant reducing the contrast of the sRGB version. for example, to reduce the amount of clipping. With trickier images like this one it can be worthwhile enabling soft proofing (with the printer profile) and tweaking tonality and colour to improve the rendition of problematic areas. 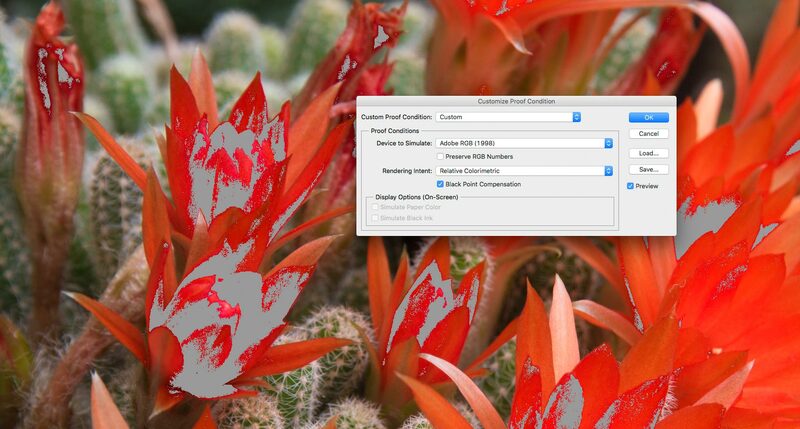 and a selective Hue/Saturation (H/S) layer to bring up the greens of the cacti themselves. The adjustments are slight. If you find yourself wanting to make quite strong changes, then take it as a hint that your original photo may not be optimally processed, or even just not very good for making a print. After adjustments I also checked the gamut warnings again in the print dialog – more as a check that I’d not overdone the changes. Remember that the grey areas might only be slightly out of gamut and almost imperceptible in an actual print. As well as the file versions in ProPhoto and sRGB, I printed versions using the perceptual rendering intent. This gives a slightly more contrasty image (with my profiles) and may or may not look better for some images. I also produced a second ICC profile with different settings (same measurement data) which bumped up saturation a small amount, as well as contrast. 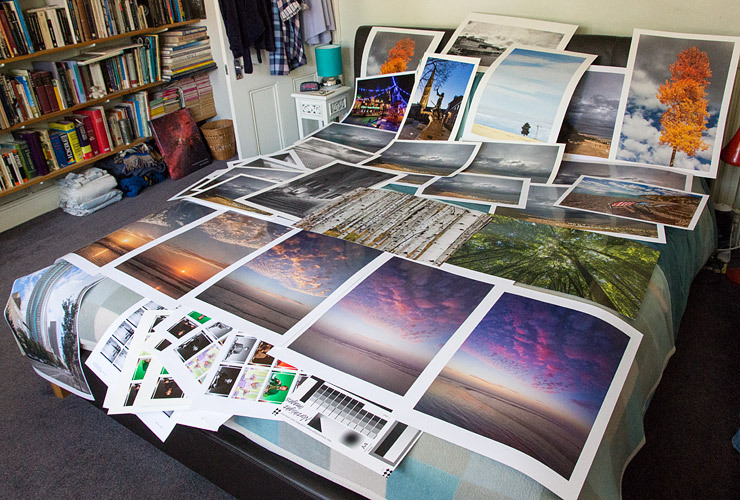 A while later I had a pile of prints – what to make of them? What has this short test told me? Well, I’ve seen how real life photos can have intense colours in them that easily go beyond the limits of a colour space such as sRGB, They nudge past Adobe98 in places and need a larger space such as ProPhoto to hold them all. I say ‘all’ though I’m actually referring to the range my camera captured, which in turn is just its representation of the light that’s come through the lens. I’ve long used ProPhoto for the colour images I’m going to convert into black and white. I want to keep as much information in the colour image as possible, since colour variation (even if I can’t see it on my monitor) can become tonal variation when converted to black and white. For display I can clearly see the benefits of the wider gamut monitor, although I’ve worked on a smaller gamut monitor for years without issues, so it’s something you can work with. In the same way I was able to edit A98 images on my old ~sRGB monitor, I can edit ProPhoto ones on a wider gamut one. 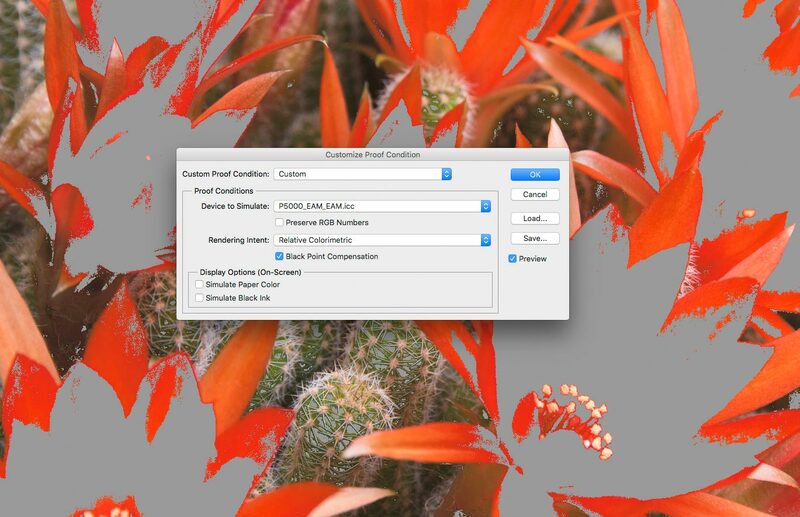 Editing beyond the gamut of your monitor takes care – a judicious soft proof using your monitor profile can alert you if you’re unsure, although remember that it’s a blunt tool, so do actually think about what’s in those areas. For print, I was impressed by the gamut of the P5000 and the glossy paper I was using. Not entirely unexpected given my extensive testing of the (17″) P5000, and of the larger (24″) P7000 for the reviews. The printers handle strong colours well, but I’m always aware of the fact that screen and print are two different mediums. Making great prints involves understanding this and knowing that things like a brilliant luminous red on a screen simply won’t ever look the same as ink on paper. The row of sunset photos (from my PRO-1000 printer review) were each tweaked in different ways to get the balance of colour in the prints right, after checking soft proofs. 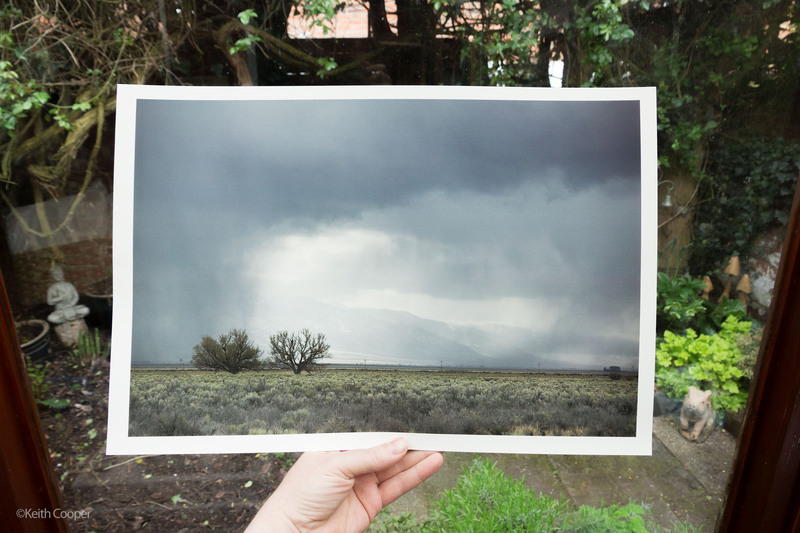 For almost all the other prints I didn’t check soft proofs at all – it’s a powerful tool that with practice and experience can be very helpful. My only concern is that too many people end up using it as a ‘crutch’ to avoid deeper consideration of what’s in a print, how it works for viewers and even whether it’s actually a good photo to start with. 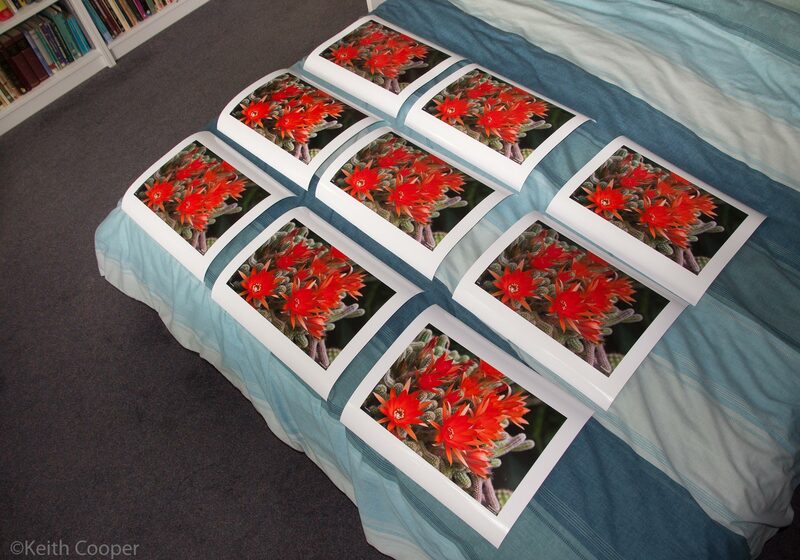 So, in making a print of the flowers I’m looking to give the feeling of brilliance. Brilliance is not just big blobs of colour, but big blobs of colour with detail in them. It’s this detail that working in the larger space and on the wider gamut monitor gives me. I have to remember though that not every good photograph on my screen makes a great print. If you find yourself trying to edit your soft proof version too much then step back and think again about the photo. I’m using a glossy paper here to experiment with, but if you’ve seen any of my printer reviews, you’ll know I test a lot of papers, with widely varying characteristics. Some images just work better on different papers. 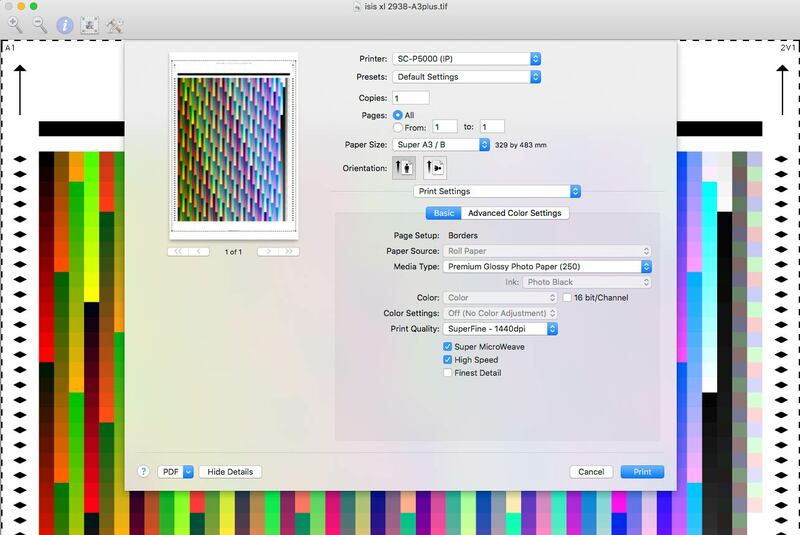 It’s possible to print colour images on relatively small gamut matt art papers, you just need to know which ones. Unfortunately I can’t give you an answer for which images. You need to practice and trust your own tastes. The colours are not strong – I edited the original image on my old Apple Cinema display (~sRGB) The image is quite light here (in the conservatory) but shows the distinct green flush of new growth in the sagebrush and cottonwood trees. A similar test, using a whole range of papers from the P7000 review. It’s very difficult to show differences in these web images, but they are there. Both sRGB and ProPhoto versions were printed direct from the converted RAW files and then with a few minor adjustments. To be extra sure I gave the set of prints to Karen to look at, since I know she has more discerning colour vision than I do (she designs jewellery as well as helping run Northlight Images). The differences were subtle until you spotted them, and then quite obvious. All of the sRGB version rated lowest, and in general the ones using Relative Colorimetric rendering intent looked better than the Perceptual renderings. The X-Rite ICC profiles do tend to increase contrast and saturation in the Perceptual rendering intent, so this was pushing my edited images a bit too far. Best was a ProPhoto image with a slight increase in brightness from a curve, and a slight boost to the greens. Showing this here is almost impossible, but here’s an image that gives a feel for the difference between the ProPhoto and sRGB versions. Remember, you’re seeing a photo of prints. This image is in the sRGB colour space. The flowers in the top print just have more depth to them. It’s perhaps not quite this obvious if you were to pick up any one of the prints and look at it on its own. What about using Adobe98 for the converted RAW files? I did try one print and couldn’t see much difference from the ProPhoto version. I’m sure that photos do exist where the difference would be more obvious, but to me it’s not working in sRGB that makes the biggest difference. If I were sending prints off to be printed and the company only accepted sRGB images I’d be concerned. That said, unless we’re specifically asked for something else, all our commercial images are supplied in sRGB. The sRGB prints were not ‘bad’, just not as good as the ProPhoto ones. I believe I could make a good looking print of this image on a wide variety of smaller printers (See my XP-960 review which includes a discussion of print gamut). That said, a basic 4 ink (CMYK) printer would be a challenge for an image like this. Having a (profiled and calibrated) wider gamut monitor made the editing easier and predictable. The glossy paper and P5000 give you a very good gamut. Custom printer profiles can give you an edge – if well made. Converting my RAW image files into ProPhoto can be useful to prevent clipping of very intense colours, as long as you are aware of this when editing. Having Adobe98 as my ‘print’ working space would not often go wrong. Soft proofing gives a helpful guide when trying to print intense colours or on smaller gamut papers. However, it needs using with care, not as a habit. Printing images like these flowers takes some care. Most of my images and many prints don’t need this level of attention – our clients will still get digital images in sRGB by default. Experiment yourself – always be wary of forum ‘experts’, especially the ones that announce themselves as such. I hope my quick experiments have been of interest – please do feel free to write to me, or make use of the comments form at the foot of the article. If you’re not quite happy with your print quality, you may find this collection of my most common answers to ‘Why do my prints look wrong‘ of use. It’s based on a lot of printer testing and working with people to ‘fix’ their printing.